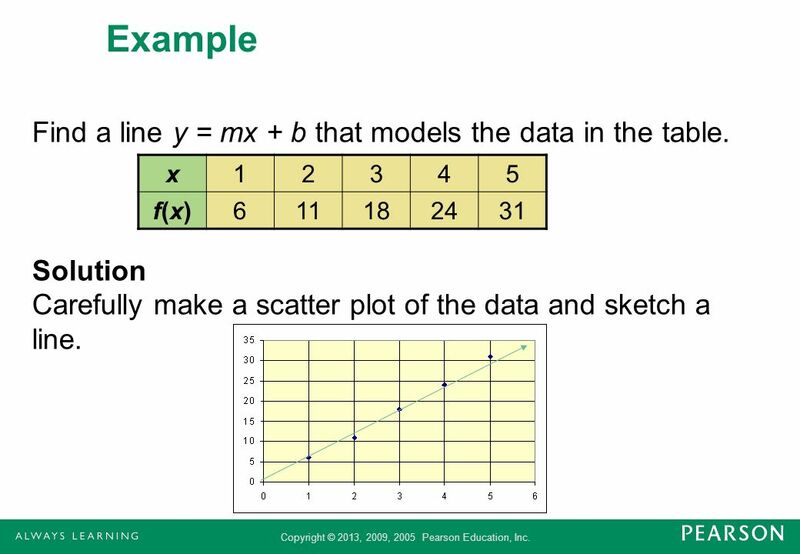 3 POINT-SLOPE FORM The line with slope m passing through the point (x1, y1) is given by y = m(x – x1) + y1 or equivalently, y – y1 = m(x – x1), the point-slope form of a line. 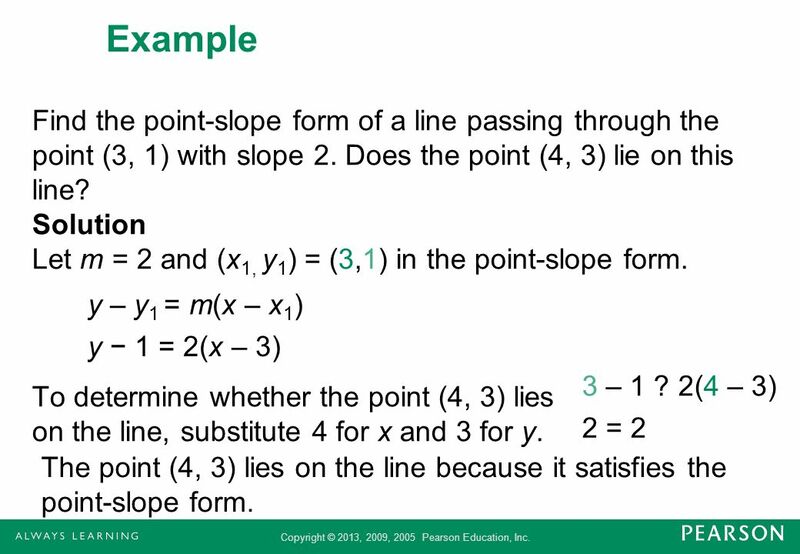 4 Example Find the point-slope form of a line passing through the point (3, 1) with slope 2. Does the point (4, 3) lie on this line? Solution Let m = 2 and (x1, y1) = (3,1) in the point-slope form. To determine whether the point (4, 3) lies on the line, substitute 4 for x and 3 for y. y – y1 = m(x – x1) y − 1 = 2(x – 3) 3 – 1 ? 2(4 – 3) 2 = 2 The point (4, 3) lies on the line because it satisfies the point-slope form. 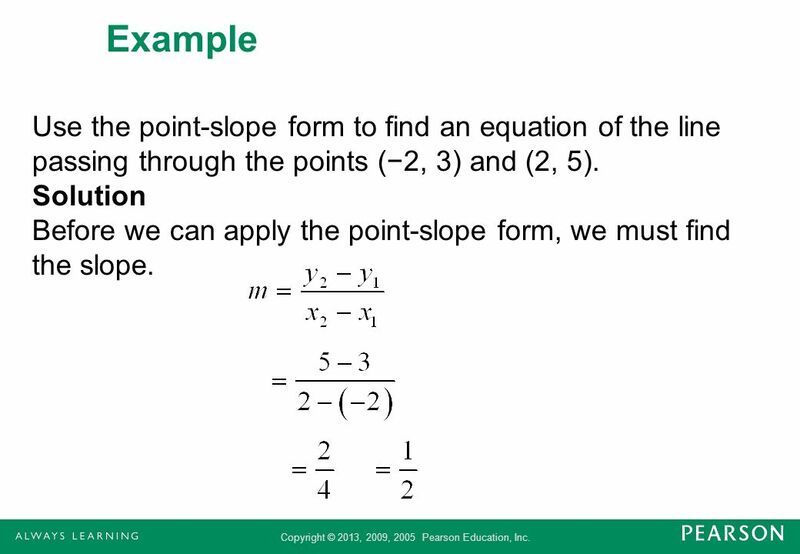 5 Example Use the point-slope form to find an equation of the line passing through the points (−2, 3) and (2, 5). Solution Before we can apply the point-slope form, we must find the slope. 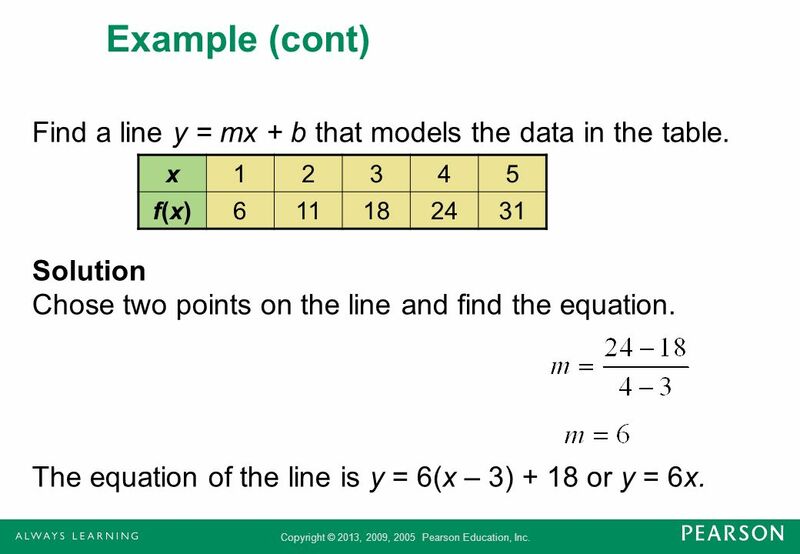 7 Example Find an equation of the line passing through (4, 2) and (1, 5). Solution First find the slope of the line. 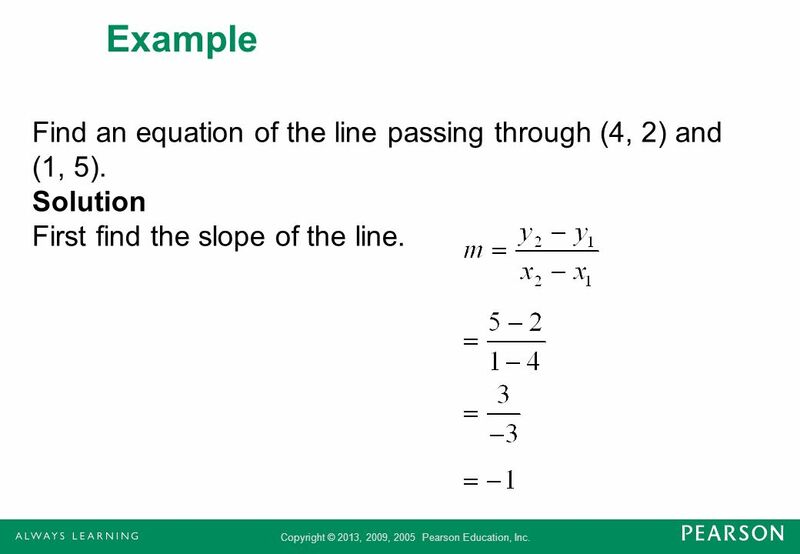 8 Example (cont) Find an equation of the line passing through (4, 2) and (1, 5). 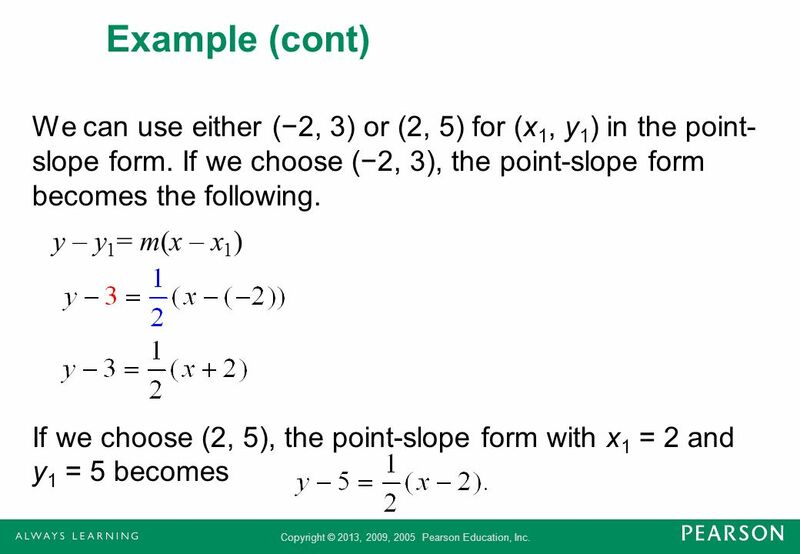 Solution Now substitute −1 for m and (4, 2) for x and y in the slope intercept form. The point (1, 5) could be used instead. The slope-intercept form is y = −x + 6. 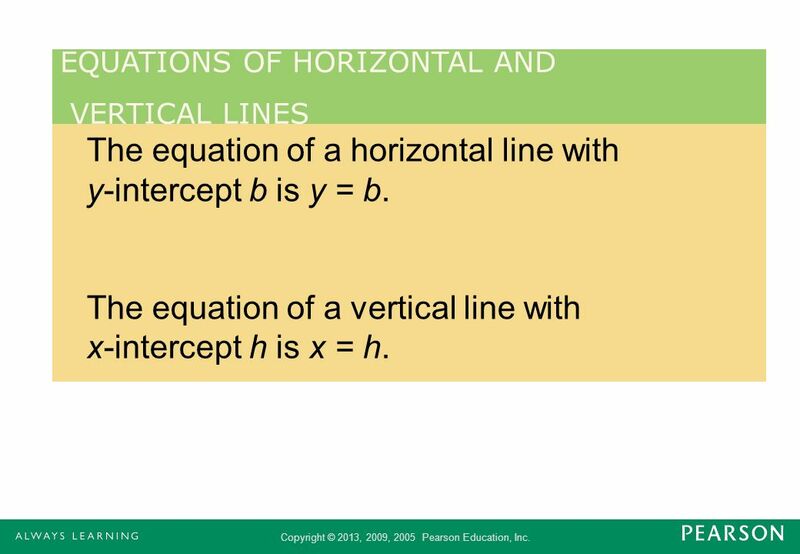 11 The equation of a horizontal line with y-intercept b is y = b.
EQUATIONS OF HORIZONTAL AND VERTICAL LINES The equation of a horizontal line with y-intercept b is y = b. The equation of a vertical line with x-intercept h is x = h.
12 Example Find equations of the vertical and horizontal lines that pass through the point (−5, 2). 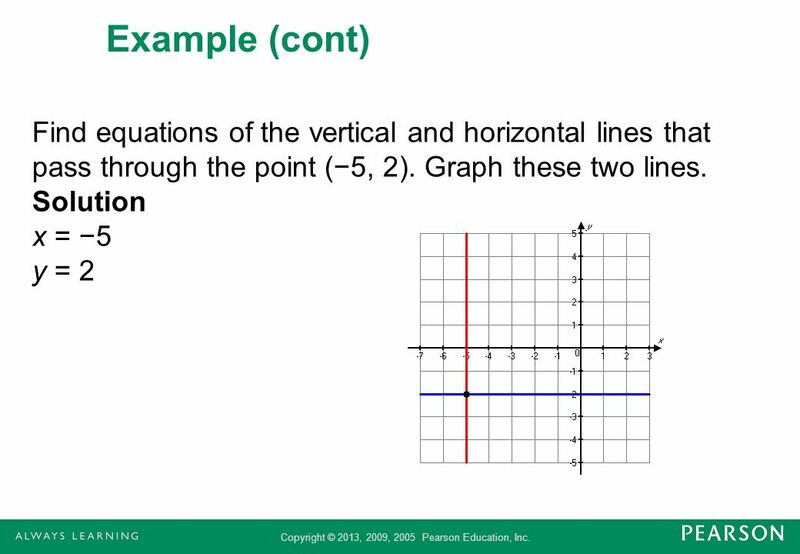 Graph these two lines. Solution The x-coordinate of the point (−5, 2) is −5. The vertical line x = −5 passes through every point on the xy-plane including the point (−5, 2). 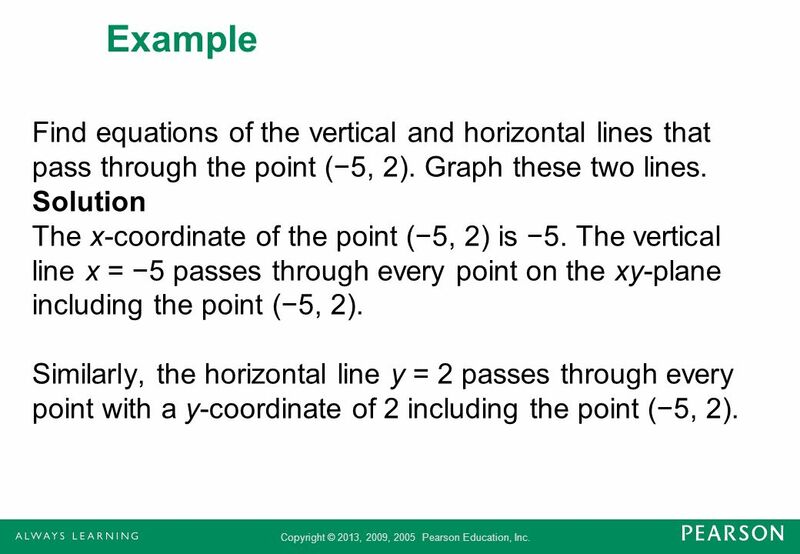 Similarly, the horizontal line y = 2 passes through every point with a y-coordinate of 2 including the point (−5, 2). 14 PARALLEL LINES Two lines with the same slope are parallel. 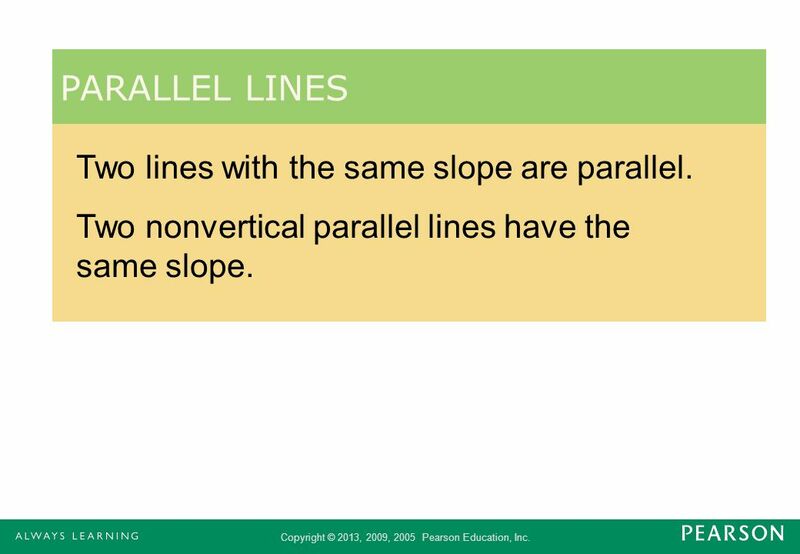 Two nonvertical parallel lines have the same slope. 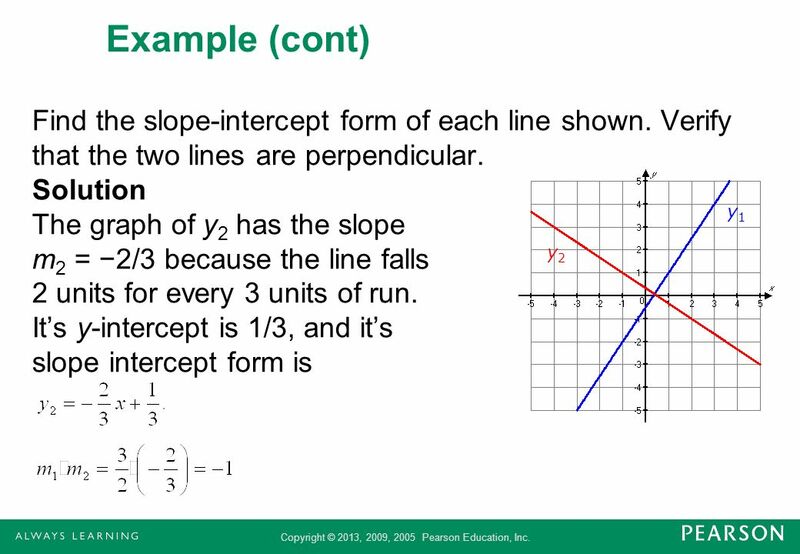 15 Example Find the slope-intercept form of a line parallel to y = 3x + 1 and passing through the point (2, 1). 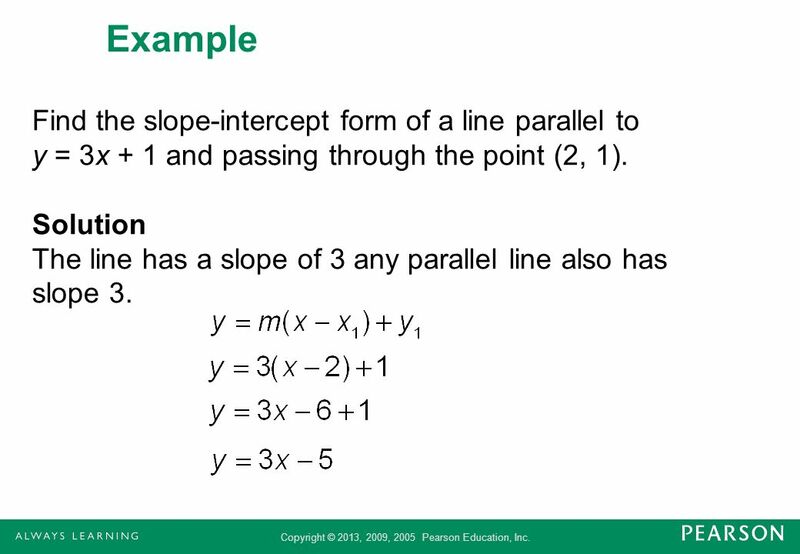 Solution The line has a slope of 3 any parallel line also has slope 3. 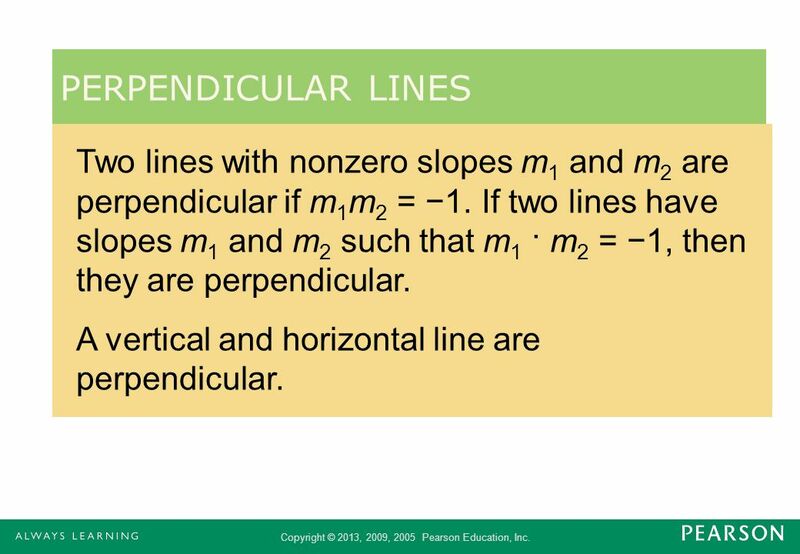 16 PERPENDICULAR LINES Two lines with nonzero slopes m1 and m2 are perpendicular if m1m2 = −1. If two lines have slopes m1 and m2 such that m1 · m2 = −1, then they are perpendicular. A vertical and horizontal line are perpendicular. 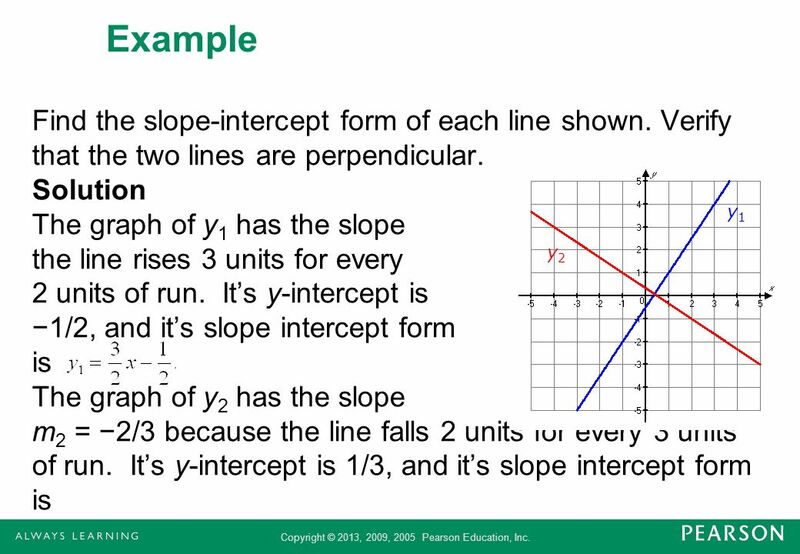 17 Example Find the slope-intercept form of the line perpendicular to y = x – 3 passing through the point (4, 6). 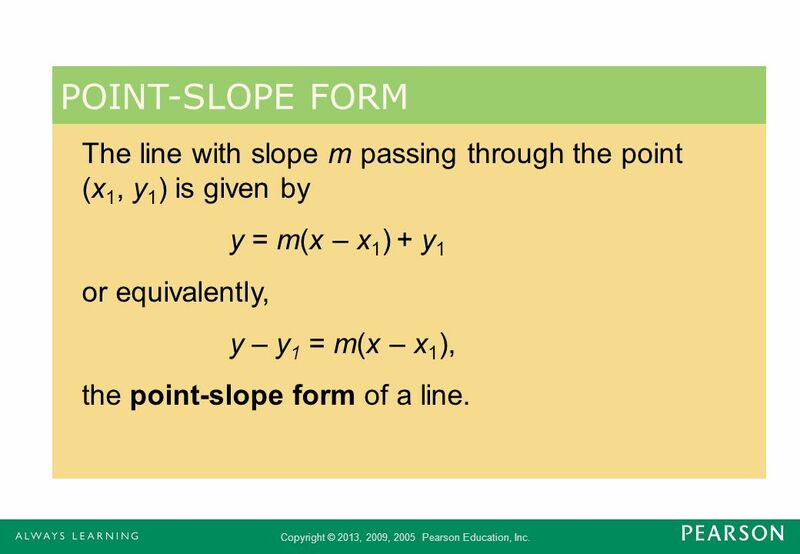 Solution The line has slope m1 = 1. 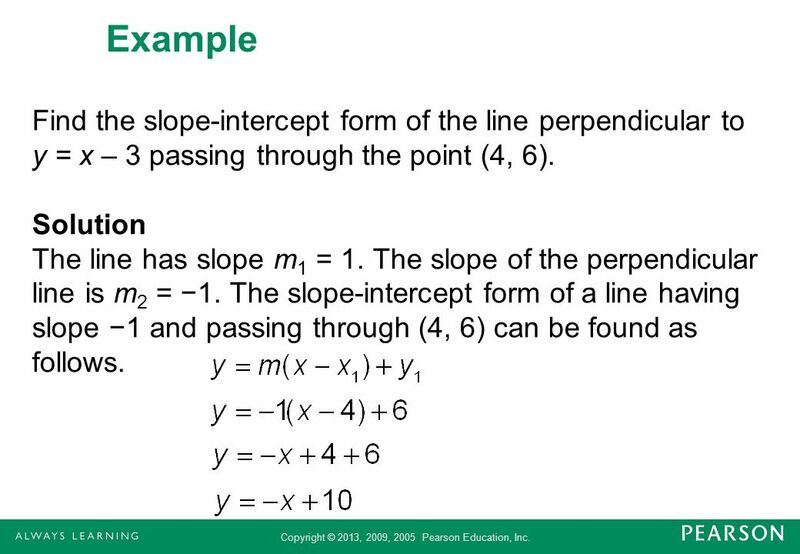 The slope of the perpendicular line is m2 = −1. 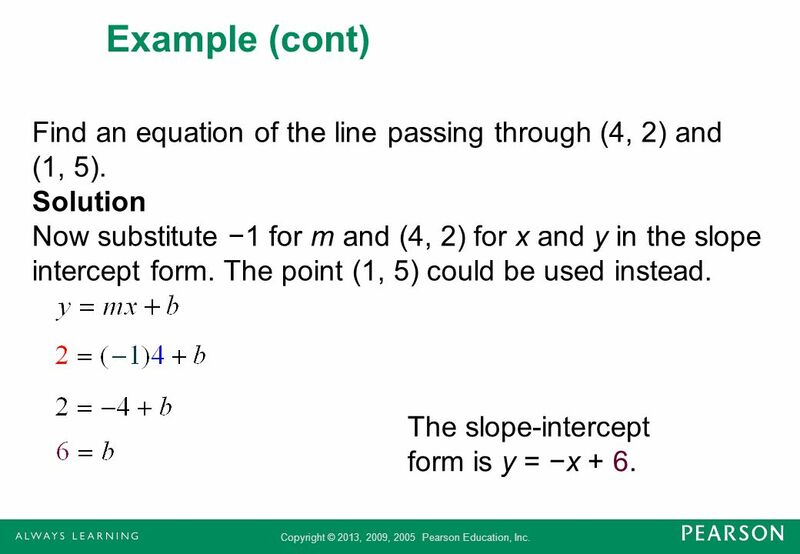 The slope-intercept form of a line having slope −1 and passing through (4, 6) can be found as follows. 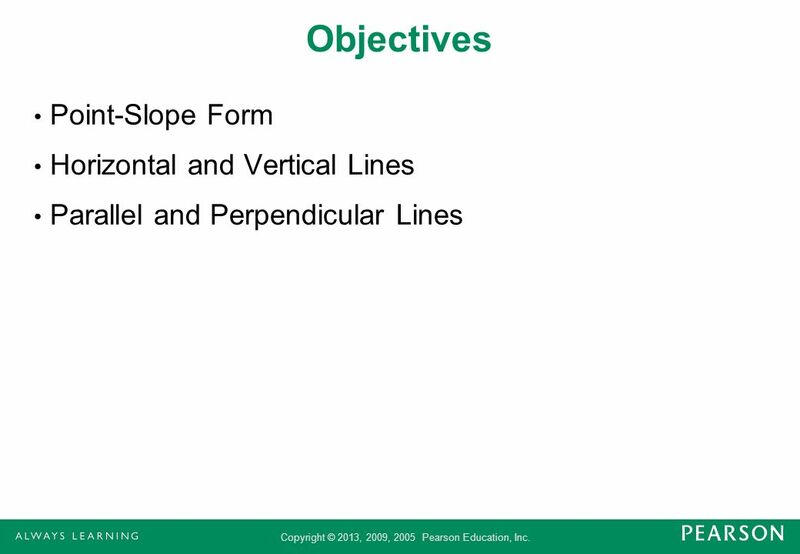 Download ppt "Equations of Lines and Linear Models"
Section 2.3 The Slope of a Line. 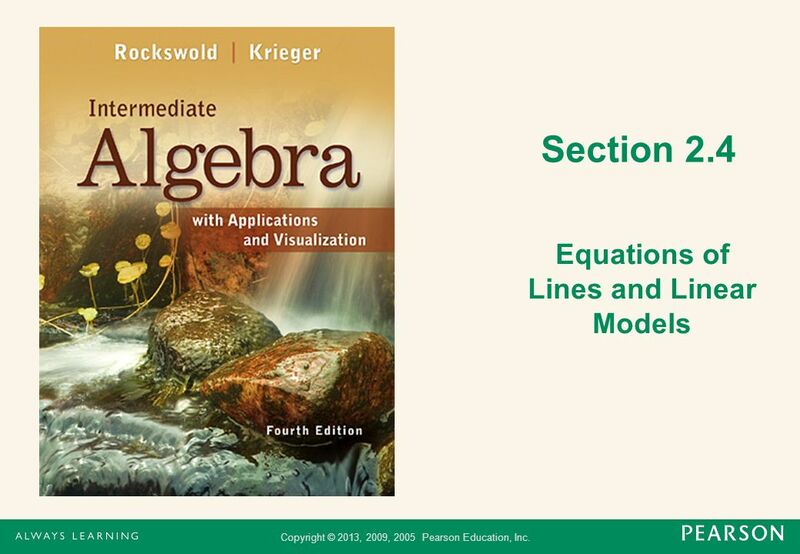 Copyright © 2010 Pearson Education, Inc. All rights reserved Sec Linear Equations in Two Variables.